Surveillance video showed an Antifa member throwing a bottle at the Proud Boys, which led to the fight. Police in New York arrested three more suspected members of the far-right group, Proud Boys, following a violent fight earlier this month with Antifa supporters, authorities announced on Monday. Irvin Antillon, 41, of Queens; Douglas Lennan, 40, of Northport, Long Island; and Maxwell Hare, 26, have all been charged with riot and assault, according to the New York Police Department. Hare, of Harrisburg, Pennsylvania, was also charged with possession of a weapon and gang assault. 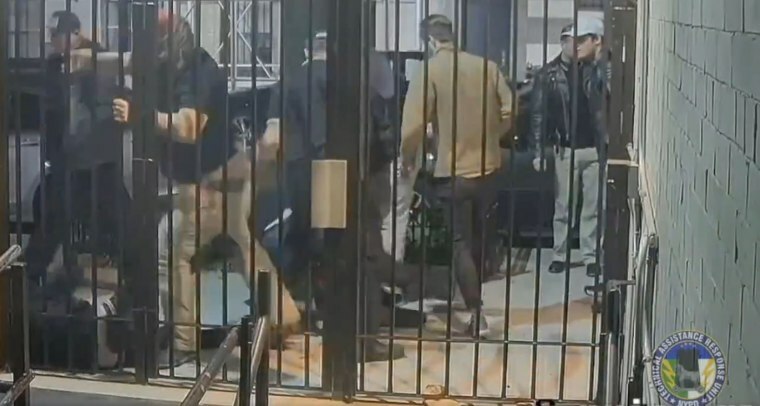 The arrests follow an Oct. 12 fight between members of the Proud Boys and masked protesters of the anti-fascist group Antifa after Proud Boys founder Gavin McInnes gave a speech at the Metropolitan Republican Club on the Upper East Side. The vicious altercation was captured on surveillance video and showed an Antifa member throwing a bottle at the Proud Boys, which led to several men punching and kicking each other. The video also showed one person getting dragged across the pavement. The first arrest was made on Thursday when police detained Geoffrey Young, 38, of New City, New York. He was charged with riot and attempted assault. John Kinsman, 39, of Morristown, New Jersey; was taken into custody on Friday and was charged with riot, gang assault, attempted gang assault and criminal possession of a weapon. Police are still searching for four Proud Boys members involved in the fight, as well as several Antifa supporters. McInnes founded Proud Boys in 2016 and describes it as a "fraternal organization" for young "Western chauvinist" men, but The Southern Poverty Law Center says it is a hate group.